Did Apple just leak the iPhone 6C? Exactly which iPhone is this? The fact that Apple announced an official Lightning dock a couple of days ago wasn't particularly exciting, but the renderings illustrating it may have revealed more than the Cupertino company wanted to give away. Until Apple spotted the slip, clicking all the way through to the last picture illustrating the dock brought up what looked like an iPhone 5C - only it has a Touch ID button without the square markings in the middle. Does it mean the iPhone 5C is getting a Touch ID upgrade? Or could it be there's an iPhone 6C in the pipeline? Perhaps Apple is ready to throw a bone to lovers of 4-inch phones after all. Apple has since changed the picture but you can see the original above. Of course this is just a rendering, not a real product, and so it may not mean anything at all... but it's fun to speculate while we wait and see what Apple really does have planned for its next batch of handsets. If this is a genuine update then it's a blunder on the part of the Apple Store webmaster. 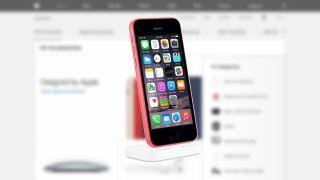 You'll remember that the iPhone 5C wasn't updated with the iPhone 6 and iPhone 6 Plus, though it's still on sale. That means it would be overdue an update this September. We've collected everything we think we know so far about the new iPhones into one handy hub for your convenience. The most recent rumours are that Apple may bring forward an announcement to August - though we think that's unlikely to happen. Here's what we want to see from the iPhone 6C.